All parenthood and no dining out makes Fidel a dull boy. Thankfully, I've been blessed with a very portable daughter. Whether or not this spells doom for her teenage years, I can't say, but for now, she is more laid back than a Jamaican in Amsterdam, and that's a beautiful thing when it comes to date night with no babysitter. Sometimes you just need someone else to pour the wine and cook the food, so we strapped Baby Gastro in the carseat, packed up the sweet diaper backpack, and headed to Campbell's Place for said services this past Friday. Located at roughly the midpoint of Chestnut Hill's stretch of Germantown Avenue, it's great for both old money and new money (and in our case, no money) Northwest Philadelphians. The menu reflects the clients, running the spectrum from a burger with your choice of toppings to filet mignon with truffled mashed potatoes. In between, pub standards such as fish and chips, and a few departures, notably, guava glazed ribs, and a veggie burger that could make me quit meat (well, that might be a bit dramatic). 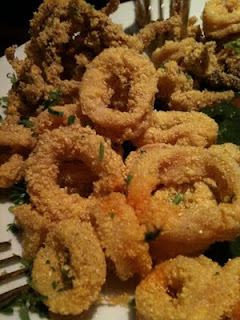 Following our noses, we started with a plate of cornmeal dusted calamari. Fried anything is good, but when it comes to calamari, it's a tad more difficult. Cook it too long and you find yourself chewing on an assortment of novelty squid pencil erasers. This was not the case for what came out. After the initial crunch of cornmeal, each bite melted in my mouth. There wasn't even a need for the accompanying marinara. For entrees, we ordered his and hers burgers, mine being a Paulie burger with bacon and bleu cheese, Mrs. Gastro's being a veggie burger. 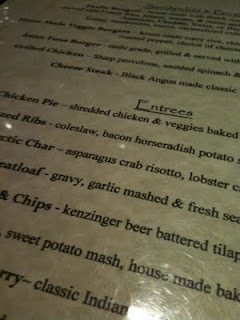 The his burger, while cooked to my liking, had the opulence one associates with a steak dinner. 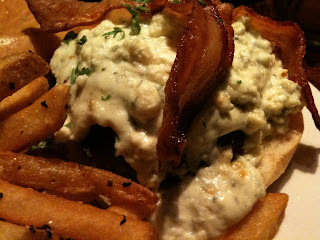 A severe helping of blue cheese and bacon--usually something I would gobble up (and I did anyway)--punished the rest of the plate. To make matters worse, the handful of light-refracting salt crystals strewn all over the fries made my tongue feel like an old nautical rope. I had to order a second beer to fend off the impending dehydration. On the other side of the table, however, we found a true gem. The hers burger is without a doubt the best interpretation of a veggie burger I have ever tasted. 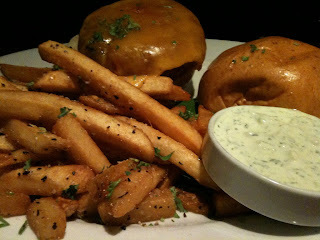 Composed of Indian flavors, it was like eating a samosa on a bun. Texturally (and just like magic), the makeup of curry rice and vegetables was such that it didn't crumble into a mushy mess that one typically associates with non-processed and frozen veggie burgers. It was served with a creamy yogurt dill sauce that was not quite as thin as a raita, so it was perfect for dipping both sandwich and fries. No dessert this time around, but we will be back for sure, undoubtedly to eat this veggie burger of veggie burgers. The atmosphere is casual and fun, albeit a bit cramped, and the popularity of the place makes it moreso. The establishment is long and narrow, and I would argue that the best seats in the house are at the bar (hard to sit there with a baby, though). The hostess service was very accommodating, but our waitress seemed annoyed. She wasn't exactly a jerk, but she wasn't very nice, either. If you find yourself in Chestnut Hill and you've already had the Schmitter, grab a table at Campbell's Place and see what makes it so m'm m'm good. * Buen provecho. Campbell's Place is located at 8337 Germantown Avenue in Chestnut Hill (that's in Northwest Philly). We got full and drunk for $55 including tip. Full disclosure: I have a tall and handsome friend that introduced me to the owners, but they didn't remember who I was when we were there. *I really hope Campbell's Soup doesn't sue me. I didn't even read the whole post yet, but had to tell you: YES, take your infant out once the Docs say public interaction is safe. YES YES YES. We did this often after out first was born. It usually works great 'cause they sleep a ton, can't get away, don't really do or say much, etc. It won't always be this way, so now is the time to enjoy it. We found that our portable car carrier/cradle thing usually fit nicely (and safely) in the top of many high chairs at restaurants.